Andhra Pradesh September 17, 2015: Konica Minolta Business Solutions India Pvt. Ltd., a leader in digital printing, recently participated in a three day event in Photo Today Vijayawada 2015. This event took place at Convention Centre, from 4th to 6th September 2015 in Vijayawada. Andhra Pradesh: Konica Minolta Business Solutions India Pvt. Ltd., a leader in digital printing, recently participated in a three day event in Photo Today Vijayawada 2015. This event took place at Convention Centre, from 4th to 6th September 2015 in Vijayawada. Photo Today Vijayawada 2015 was a Photography, Videography & Digital Imaging Expo. The event provided an interactive platform to the professionals related to these sectors to converse with each other and advance in their respective sectors. 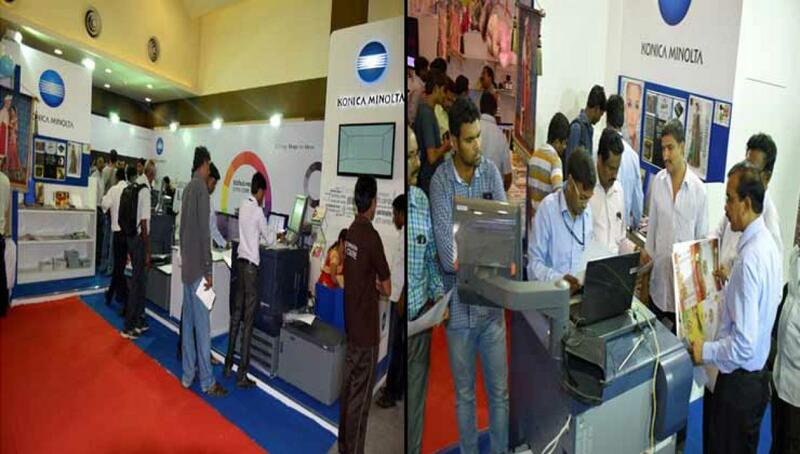 In the Photo Today Vijayawada 2015, Konica Minolta displayed C1085 & C70HC with print Xpress software to manage the image printing workflow. bizhub PRESS C1060 can print on wide variety of media and also provides the flexibility to print on media up to 13x47” for book covers; etc. Besides this, a full page in the album like a traditional RGB album can also be prepared on customers’ demand.